After receiving his B.Music with High Distinction in classical piano from Indiana University, and his master's in jazz from the Manhattan School of Music, the Emmy-winning composer D.D. Jackson began his career as a jazz pianist/composer, and went on to record, perform, and tour around the world with some of the most acclaimed names in jazz and beyond, including drummer Jack Dejohnette, and saxophonists James Carter and David Murray (with whom he recently completed a week at New York's historic Village Vanguard). 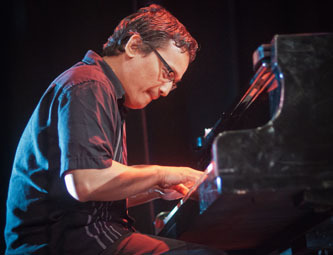 He also has collaborated frequently with Questlove and The Roots, most recently appearing with them on piano at the theater of Madison Square Garden for the John Lennon 75th Birthday Concert at Radio City Music Hall (for which he also wrote 30-piece orchestral arrangements), and as an arranger/producer/pianist on their last two CDs. Jackson has also recorded 12 jazz CDs as leader or co-leader (including two for the major label BMG) featuring his original compositions, ranging from his Juno Award–winning solo piano CD ...so far, to his larger-scale meditation on the events of 9/11 entitled Suite for New York; and two operas, including Quebecite [pronounced "KAY-beh-SEE-tay"] (based in part on his African-American father and Chinese mother), and Trudeau: Long March/Shining Path (about the father of Canada's current leader, Justin Trudeau), both written with librettist George Elliott Clarke (the recently-appointed Poet Laureate of Canada). Jackson has also been successfully composing music for television, film, and other media for the past several years, receiving his first Emmy Award for Outstanding Music Direction and Composition in 2016 for his writing on the PBS show Peg+Cat (after two previous Emmy nominations as composer, plus a fourth nomination in 2017 for "Best Song" with Peg+Cat co-creator Billy Aronson). He has also written regularly for The Wonder Pets on Nickelodeon (which won four consecutive Daytime Emmy Awards for Outstanding Musical Direction and Composition) and several other shows, and has done numerous commissions, most recently for the Ahn Trio and the Metropolis Ensemble. He is also doing increasing work for film, with the romantic comedy feature You & Me (for which Jackson wrote the score and collaborated on the songs with lyricist/director/co-writer Alexander Baack), recently winning the 2018 Cinequest Film Festival Audience Award for best comedy feature. As a writer, Jackson has also penned articles for such publications as the Village Voice and DownBeat magazine (for which he maintained a popular column on his experiences as a jazz musician entitled "Living Jazz," for five years). As an educator, Jackson has taught part-time at Hunter College for over eight years, teaching History of Jazz (among other jazz-related subjects) and directing the Popular Music Combos, and was recently awarded the Hunter College Presidential Award for Excellence in Teaching. He also recently began teaching Media Scoring at the Feirstein Graduate School of Cinema (Brooklyn College), and was previously the chair of jazz and contemporary studies at the Harlem School of the Arts (where his past students included 15-year-old prodigy and Hammond and Yamaha Artist Matthew Whitaker, and recent The Voice finalist We' McDonald). Jackson lives in Maplewood, New Jersey (just outside of New York City), with his wife, Elizabeth, and their 11-year old son, Jarrett, and nine-year old daughter, Aria.